Having been quite happy with my PlayStation 1, I opted not to buy a PS2 when it came out. This was primarily because most of the games I had on the PlayStation were now being offered on the PS2. Did I really need an updated copy for a new $300 console? Nope. I bought 2 PS2' in 2010 when the price dropped to $99 and my original PlayStation died. I had a slew of retro game discs from Midway, Atari, Namco, Activision and Williams that I couldn't just lose. Since the PS2 is backward compatible with the PlayStation I had to get one... and then another (just in case). The PlayStation 2 (officially abbreviated PS2) is a sixth-generation video game console manufactured by Sony. The successor to the PlayStation, and the predecessor to the PlayStation 3, the PlayStation 2 forms part of the PlayStation series of video game consoles. Its development was announced in March 1999 and it was first released in March 2000 in Japan. Its primary competitors were Sega's Dreamcast, Microsoft's Xbox, and Nintendo's GameCube. 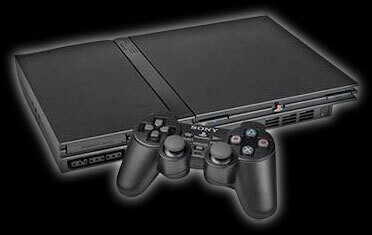 The PS2 is the best-selling console of all time, having reached over 147 million units sold as of November 2010. In late 2009, with developers creating new games and the console still selling steadily a decade after its original release, Sony stated that the life cycle of the PlayStation 2 will continue until demand ceases. Only a few million people had obtained consoles by the end of 2000 due to manufacturing delays. Directly after its release, it was difficult to find PS2 units on retailer shelves. Another option was purchasing the console online through auction websites such as eBay, where people paid over one thousand dollars for a PS2. The PS2 initially sold well partly on the basis of the strength of the PlayStation brand and the console's backward compatibility, selling over 980,000 units in Japan by March 5, 2000, one day after launch. This allowed the PS2 to tap the large install base established by the PlayStation - another major selling point over the competition. Later, Sony added new development kits for game developers and more PS2 units for consumers. Many analysts predicted a close three-way matchup between the PS2 and competitors Microsoft's Xbox and the Nintendo GameCube (GameCube being the cheapest of the three consoles and had an open market of games); however, the release of several blockbuster games during the 2001 holiday season maintained sales momentum and held off the PS2's rivals. Although Sony, unlike Sega with its Dreamcast, placed little emphasis on online gaming during its first few years, that changed upon the launch of the online-capable Xbox. Sony released the PlayStation Network Adapter in late 2002 to compete with Microsoft, with several online first-party titles released alongside it, such as SOCOM: U.S. Navy SEALs to demonstrate its active support for Internet play. Sony also advertised heavily, and its online model had the support of Electronic Arts. Although Sony and Nintendo both started out late, and although both followed a decentralized model of online gaming where the responsibility is up to the developer to provide the servers, Sony's attempt made online gaming a major selling point of the PS2. In September 2004, in time for the launch of Grand Theft Auto: San Andreas, Sony revealed a new, slimmer PS2 (see Hardware revisions). In preparation for the launch of the new models (SCPH-70000-90000), Sony stopped making the older models (SCPH-30000-50000) to let the distribution channel empty its stock of the units. After an apparent manufacturing issue-Sony reportedly underestimated demand-caused some initial slowdown in producing the new unit caused in part by shortages between the time the old units were cleared out and the new units were ready. The issue was compounded in Britain when a Russian oil tanker became stuck in the Suez Canal, blocking a ship from China carrying PS2s bound for the UK. During one week in November, British sales totalled 6,000 units - compared to 70,000 units a few weeks prior. There were shortages in more than 1700 stores in North America on the day before Christmas. The original life span for the console was set at 10 years, but according to Sony, its lifecycle will continue as long as developers continue to make new games for the system, and as long as the console and its games continue to sell. The PS2's DualShock 2 controller is essentially an upgraded PlayStation DualShock; analog face, shoulder and D-pad buttons replaced the digital buttons of the original. Like its predecessor, the DualShock 2 controller has force feedback, which is commonly called the "vibration" function. The standard PlayStation 2 memory card has an 8 MB capacity and uses Sony's MagicGate encryption. This requirement prevented the production of memory cards by third parties who did not purchase a license for the MagicGate encryption. Memory cards without encryption can be used to store PlayStation game saves, but PlayStation games would be unable to read from or write to the card - such a card could only be used as a backup. There are a variety of non-Sony manufactured memory cards available for the PlayStation 2, allowing for a larger memory capacity than the standard 8 MB. However their use is unsupported and compatibility is not guaranteed. The console also features USB and IEEE 1394 expansion ports. Compatibility with USB and IEEE 1394 devices is dependent on the software supporting the device. For example, the PS2 BIOS will not boot an ISO image from a USB flash drive or operate a USB printer, as the machine's operating system does not include this functionality. By contrast, Gran Turismo 4 is programmed to save screenshots to a USB mass storage device and print images on certain USB printers. A PlayStation 2 HDD can be installed in an expansion bay on the back of the console, and was required to play certain games, notably the popular Final Fantasy XI. This was only available on certain models. Vector Units: VU0 and VU1 (Floating Point Multiply Accumulator × 9, Floating Point Divider × 1), 32-bit, at 150 MHz. Automatically underclocked to 33.8688 MHz to achieve hardware backwards compatibility with original PlayStation format games. Infrared remote control port (SCPH 5000x and newer) - IEEE 1394 port removed and Infrared port added in SCPH-50000 and later hardware versions. Disc Drive type: proprietary interface through a custom micro-controller + DSP chip. 24x speed (PlayStation 2 format CD-ROM, PlayStation format CD-ROM), 4x (Supported DVD formats) - Region-locked with anti-copy protection. Can't read Gold Discs. Supported Disc Media: PlayStation 2 format CD-ROM, PlayStation format CD-ROM, Compact Disc Audio, PlayStation 2 format DVD-ROM (4.7 GB)(some games on DVD9 8.5 GB), DVD Video (4.7 GB), DVD-9 (8.5 GB Double-Layer). Later models (starting with SCPH-50000) are DVD+RW, and DVD-RW compatible.